I remember many years ago, on a miserable day in the Rockies, sitting with my climbing partner in a large plasticized bag on the summit ridge of an unclimbed peak looking out of a small vent at swirling snow and thick mist. We were having a snack in the cozy confines of a bivy sac, as it was known in those days, waiting for the weather to clear before our push to the summit. Deciding recently that we needed a modern equivalent of this bag, I searched North American stores such as MEC and REI and only found blankets, tarps and modern-day bivy shelters. Expanding my search took me to the UK where bothy bags are standard outdoor emergency equipment. 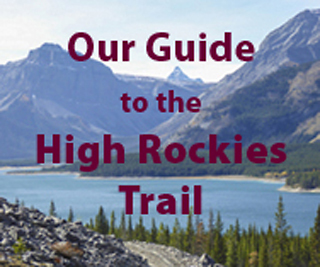 The results of my research are worth sharing with those of you who spend time in Kananaskis Country. Bothy Bag, also called Group Shelters, are large windproof bags designed for use by groups of anywhere between 2 and 12 people in the mountains. They pull over the heads of the group when they are sitting in a huddle on their rucksacks and extend right down to the ground. They very quickly provide warmth in the most hostile of conditions and can be used for anything from simple lunch stops to shelter while awaiting rescue. They are not completely waterproof to avoid he problem of condensation but they are windproof. Usually made of lightweight rip-stop nylon they have one or more vents, and clear plastic widows to avoid claustrophobia. Two person bags can be as light as 260 gm (see photo below). A 4-person bag weighs 560 gm. a bag provides provides better wind protection than a blanket. people can huddle together for warmth. being together helps maintain morale in a stressful situation. quick to deploy, easy to repack and reusable many times. Outdoor clubs may wish to consider taking a shelter with them on their outings in case someone in incapacitated and needs to wait for rescue. Unfortunately they are not available in Canada and while some UK manufacturers claim to have US distributors, they either don’t carry bothy bags, of if they do, they are out of stock. A secondary problem is that many UK outdoor stores don’t ship outside of the UK. We ordered ours from TerraNova. Check out the websites below. A bothy is a Scottish term for a basic shelter in the highlands, usually left unlocked and available for anyone to use without charge. A bivy bag, sack or shelter is a lightweight single-person alternative to a tent that adds comfort and protection to a planned or unplanned night in the outdoors. Either in the form of a protective bag, a tent-like structure supported by hoops or poles or a combination of the two. Would love to know how that proptotype works out, and when they may be available to buy. It appears that some minds do think alike. Spirit West is now producing a 2 man light weight Bothy Bag, made to order, under the Cyrex Brand. Comes with a round port style window and high visibility banding. Price comes in around $120. Great idea for an emergency storm shelter. Just came across your article moments ago.I have a lightweight bivy shelter which was designed by Jim Ongena.As a matter of fact, I am picking up a locally made sample tomorrow.I have tested Jim’s bivy,and he has as well, for at least 10 years, and can attest to it’s amazing usefulness in all conditions.We will be testing the new material in hopes that it is as good as,if not better than Jim’s original bivy material.I do have some photos of the shelter if interested. It fits in the palm of your hand.Will have the price point in a few days. Previous: The Freedom of the Hills?